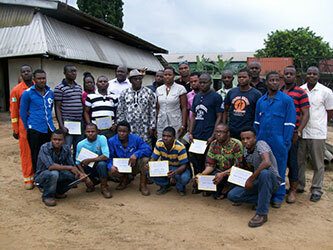 OCO Nigeria's first appointed product and service distributor of Miller welding machines and Hobart welding products started welding training about a decade ago by offering Miller approved courses to its technical and marketing staff, and technical staff of clients. Now the training program is accredited by International Institute of Welding (IIW) through Nigeria Institute of Welding (NIW). OCO Training Centre is an Authorized Training Body (ATB) of NIW. To support the Federal Government's local content initiative by providing indigenous professional welders. The Centre is totally committed to HSE and QA/QC. All manufacturers represented by OCO in Nigeria are ISO-certified, and the fabrication operation is SON certified. OCO is the only accredited Service Agent in Nigeria for ITW-Miller, AEC Technology and E.H.WACHS manufacturers of Welding Machines, Heat Treatment Machines and Pipe machining tools. In addition to training, OCO Welding Training & Centre is equipped to carry out welding procedure qualification (PQR). Governments (federal, state and local tiers), NGOs, exploration, production, construction and/or service companies that desire to undertake welding skill acquisition programs for the benefit of their citizens, host communities, etc.